What’s better than a fitted bedroom? When it’s a fitted-for-free bedroom! 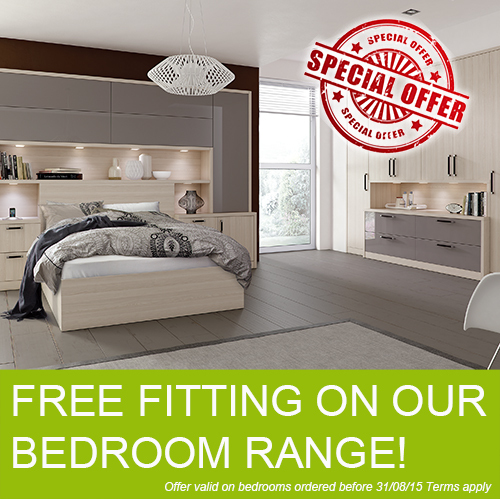 That’s right, we are offering FREE FITTING on all our bedroom ranges this summer. This makes a brand new fully fitted bedroom very affordable and an attractive alternative to free standing furniture. So if you’re looking for lots of storage, maximum use of space and clever storage solutions then now is the time to investigate the idea of a fitted bedroom furniture – great for any room but especially good for difficult spaces such as lofts, rooms with awkward spaces, such as bulk heads and chimney breasts or very small rooms. Not quite sure whether to go for fitted or free standing? Read our blog which outlines some of the benefits of fitted furniture – and the barriers! Why choose a kitchen company for a fitted bedroom? It may seem a strange choice when there are fitted bedrooms specialists out there, however we think that our vast experience in fitted kitchens gives us an advantage. Kitchens often incorporate a range of challenges; difficult spaces, limited space, services etc. In comparison, bedrooms are relatively straightforward so we can put our knowledge to good use to create really stunning bedroom designs. We also have a great, long-standing relationship with Daval Furniture, who supply the majority of both our kitchen and bedroom ranges, so we can tap into their expertise as well. All bedrooms ordered before 31st August will qualify for free fitting. We offer a free design consultation so you don’t need to make any commitment until you have seen how your bespoke bedroom design will look so what do you have to lose?! We expect this offer to be very popular and installations will be booked on a first come first served basis so get in touch now to avoid disappointment. Get in touch via our contact form or call 0800 321 3491 to arrange a visit. 0 Responses to "Summer Bedroom Offer!"